Running off to Hokkaido seemed like a suitable cure for mending my soul after a few busy days in Tokyo. This northernmost of the main islands has only 4 % of the population of the country, and they are spread out across more than a fifth of the combined land area of Japan. 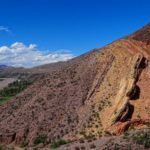 With enough time to explore, you can find plentiful wildlife here, including grizzly-size bears, and there are lots of hot springs and spectacular scenery to enjoy. 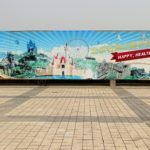 We, however, are in a bit of a hurry, so for this series from our first-time visit to the island, we’ll be looking at just the two cities of Hakodate and Sapporo. Japan’s bullet trains, the Shinkansen, look more like duck trains to me. Still, they serve their purpose well, allowing us to travel a long way in a very short time. 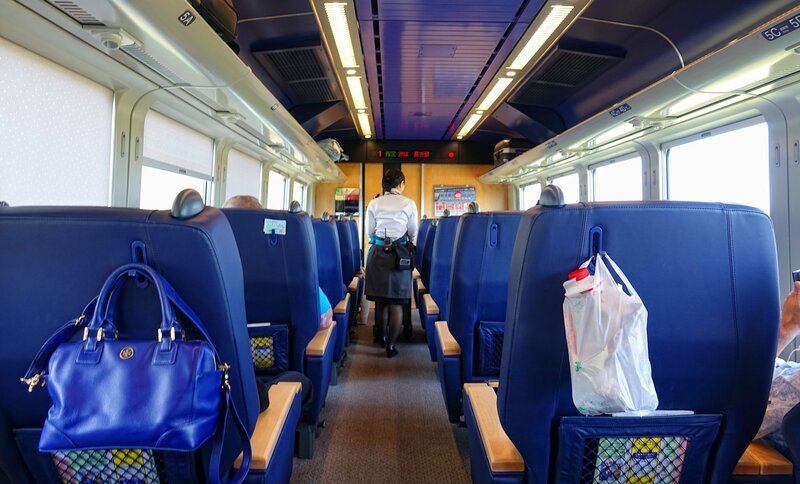 More than 800 kilometers of ground travel between Tokyo Central and Hakodate takes less than five hours. That is where the high-speed train tracks end. Eventually the Shinkansen will extend past Hakodate, but if you want to continue another 250 kilometers north to Sapporo, that will almost take almost as long as the first 800 kilometers from Tokyo do. There’s no denying that Tokyo to Sapporo is a scenic ride, but it can be both a lot cheaper and faster to combine train and plane travel instead of taking the train both ways. Because early May is a busy time for travel in Japan (Golden Week), we buy the Green JR Pass. This allows us to travel on both first class and second class. It costs just a little bit extra, and means that we most likely always can get seats on the first train to leave. 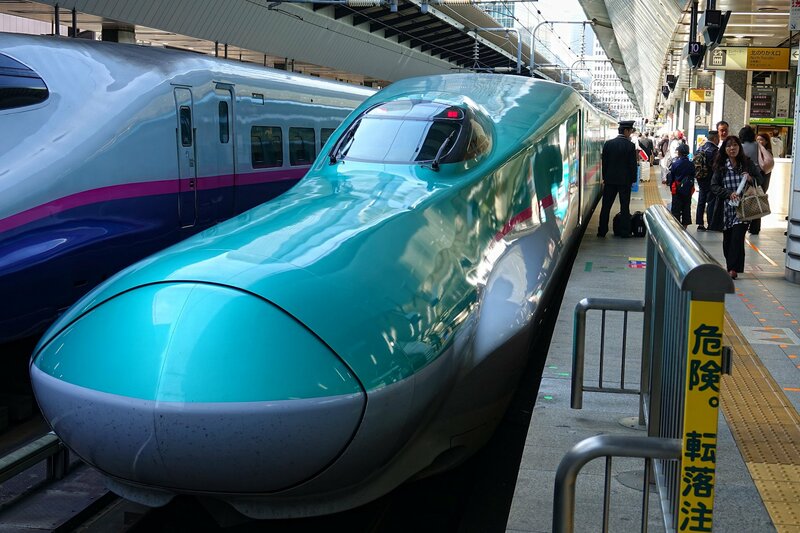 The Hokkaido Shinkansen opened in 2016, but this train looks as if it has been on duty since the 1990s. The bullet trains of Japan are known world-wide for being very fast and modern, so I must confess to being a little bit disappointed after actually traveling on one. The reputation comes from Japan being the first country to establish a large and incredibly reliable high-speed train network. 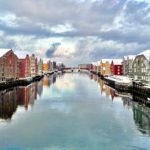 In recent years, though, you can travel in more style and at roughly the same velocity on high-speed trains in countries like Spain, Italy and China. 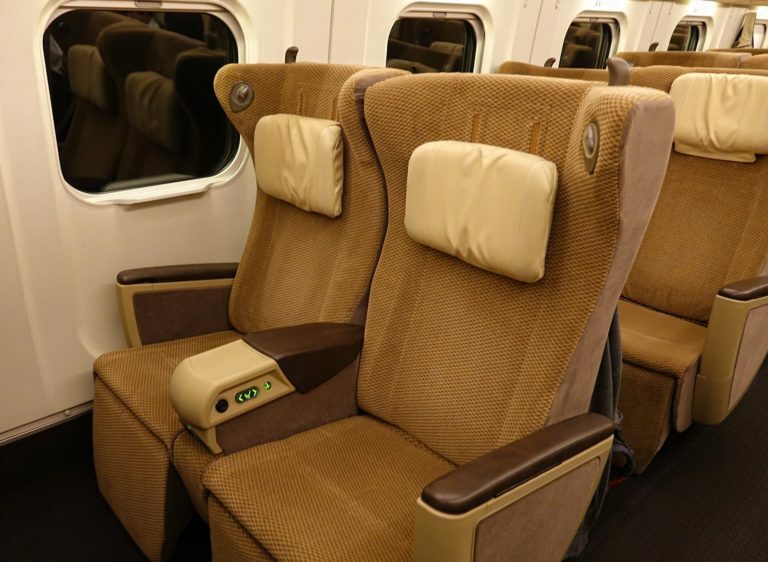 The glamour of the Shinkansen has faded. That doesn’t mean it’s gone bad, of course. It just doesn’t feel as futuristic as I guess it used to do. We’re leaving Tokyo, but it is hard to tell exactly when we actually leave Tokyo. There’s a neverending corridor of cityscape outside. When we reach Sendai, after 350 kilometers, we still feel like we’ve just been traveling through a city. 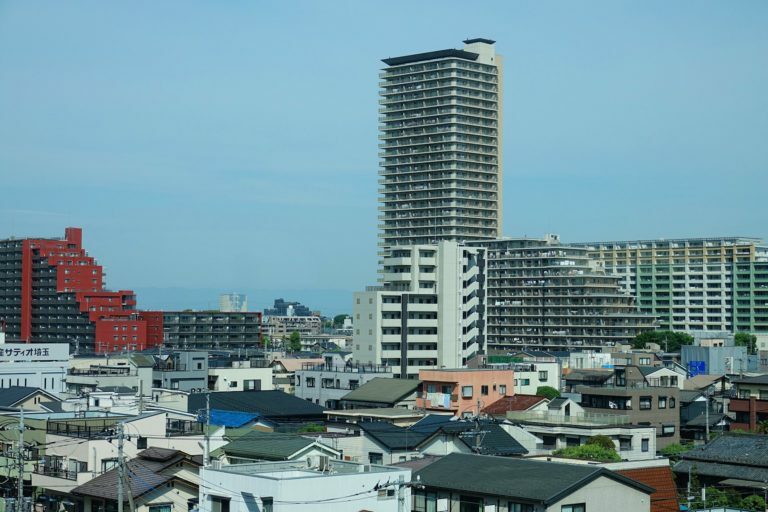 This part of Japan is densely populated. 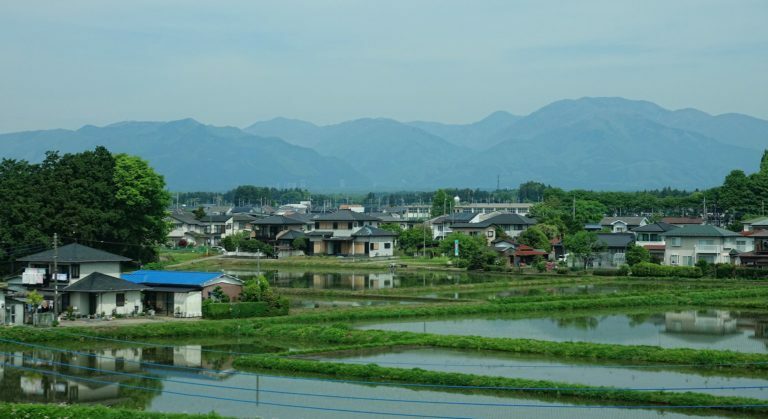 At last, north of Sendai, rural Japan starts coming into view. Rice fields and rolling hills give us a welcome change of scenery. At the northern end of Honshu Islands there’s still a little bit of winter left. 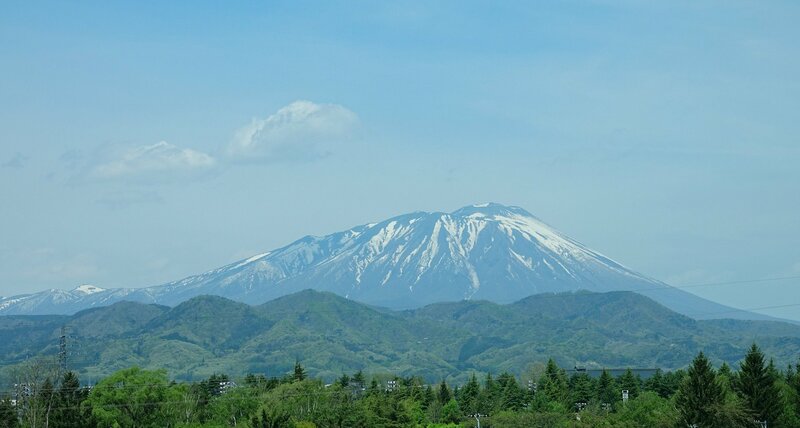 This is Mount Iwaki, near the city Hirosaki, and it looks extremely inviting for hiking. We should probably give it another month to melt away the last bits of snow. 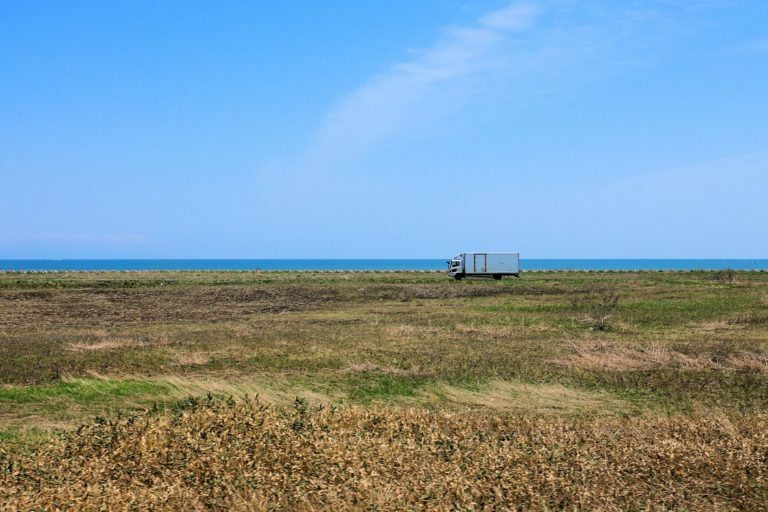 Traveling through the world’s longest underwater tunnel (the Seikan tunnel, 53.85 kilometers), takes us to Hokkaido, and the scenery has changed again. This feels decidedly more barren. 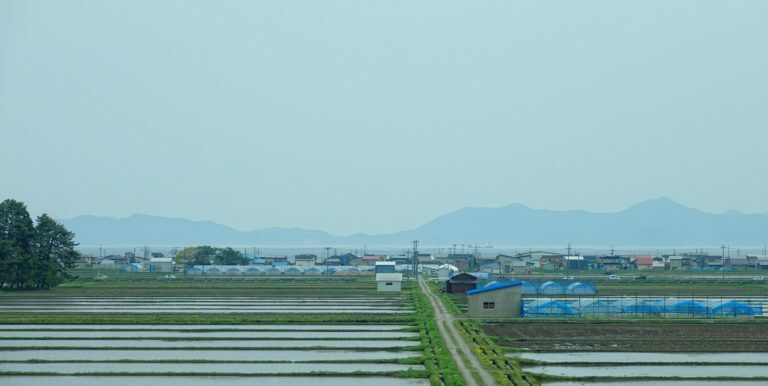 There is still plenty of agriculture, and the many fishing boats in the villages we pass indicate that the sea is rich here. We spend most of our nights in Japan business hotels like APA and Smile. 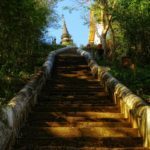 They are the cheapest option for two people, and while the rooms are tiny, they are clean and come with all the necessary facilities. 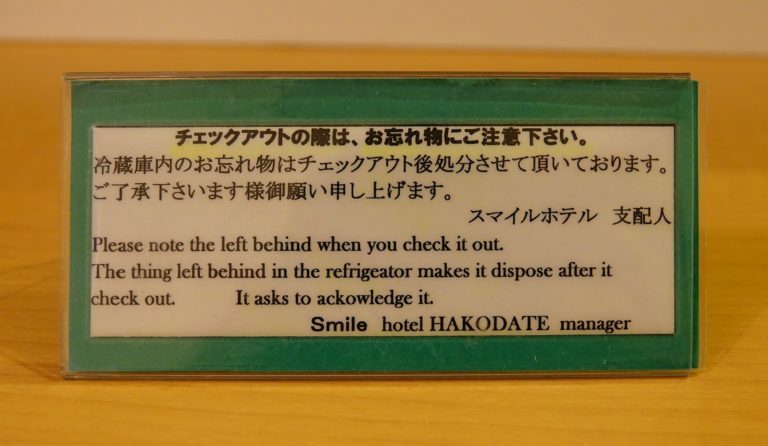 Sometimes they also bring entertainment in the shape of lovely snippets of Engrish. I have no trouble ackowledging it. 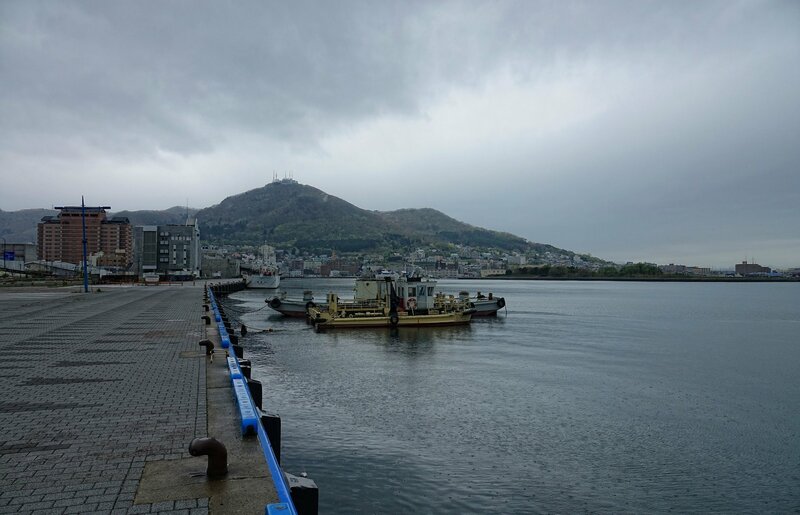 Hakodate has many gray days, and today is one of them. We go for a walk in the light rain. 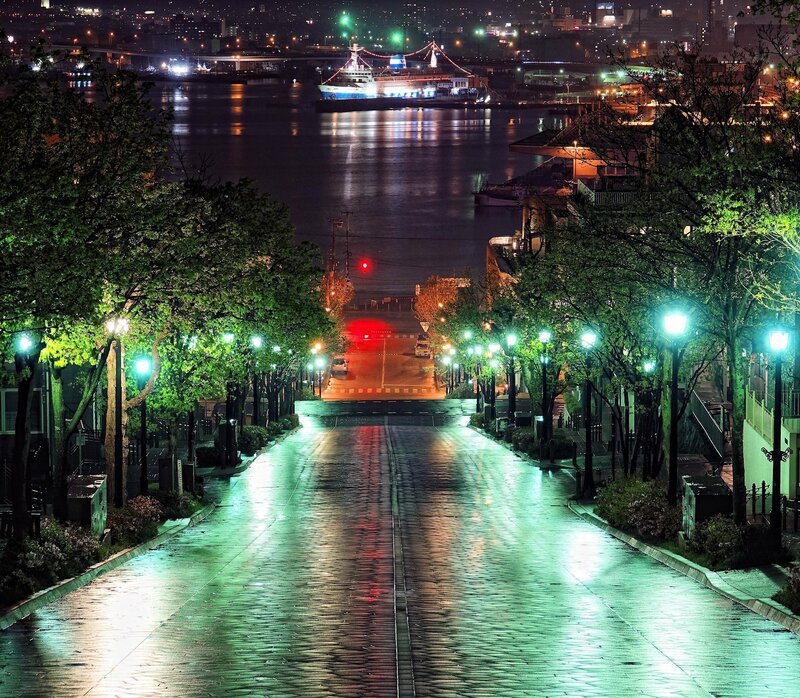 From the port we can look up at Mount Hakodate, a viewpoint famous for a spectacular night view of the city. It’s nice and quiet here early in May, with temperatures low enough to keep tourists away. 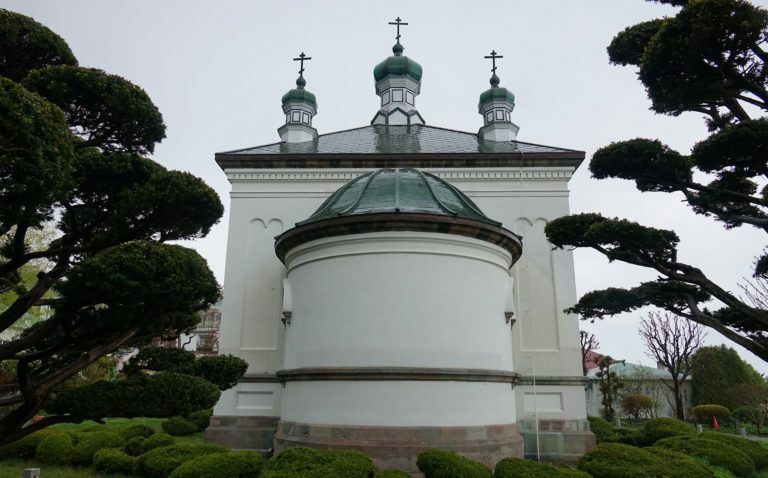 Visitors are drawn to Hakodate by how the city has been shaped by foreign influence. 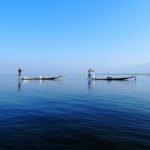 Japan was an almost completely closed island nation for more than two centuries, until in 1854 it became one of only two ports that were opened for trade with other countries. A number of consulates rapidly opened here, and many non-Japanese style buildings can still be seen in the old part of the city. 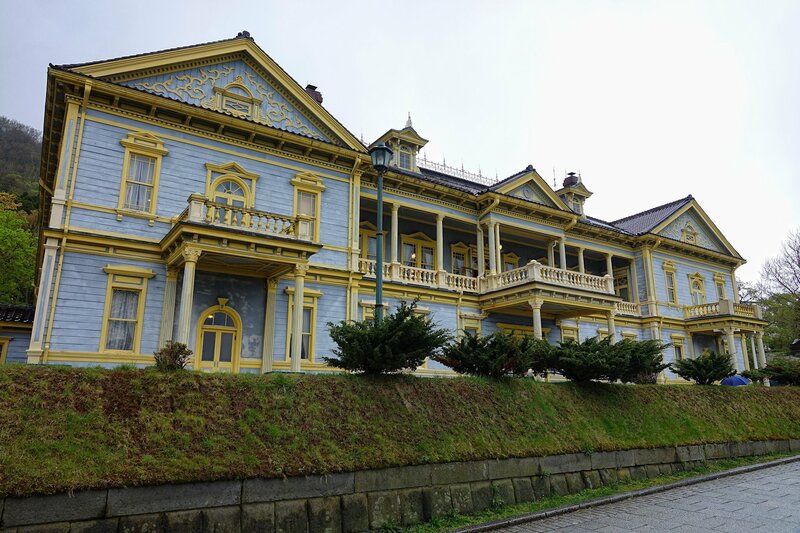 The colonial style Public Hall of Hakodate Ward is an excellent example of that. 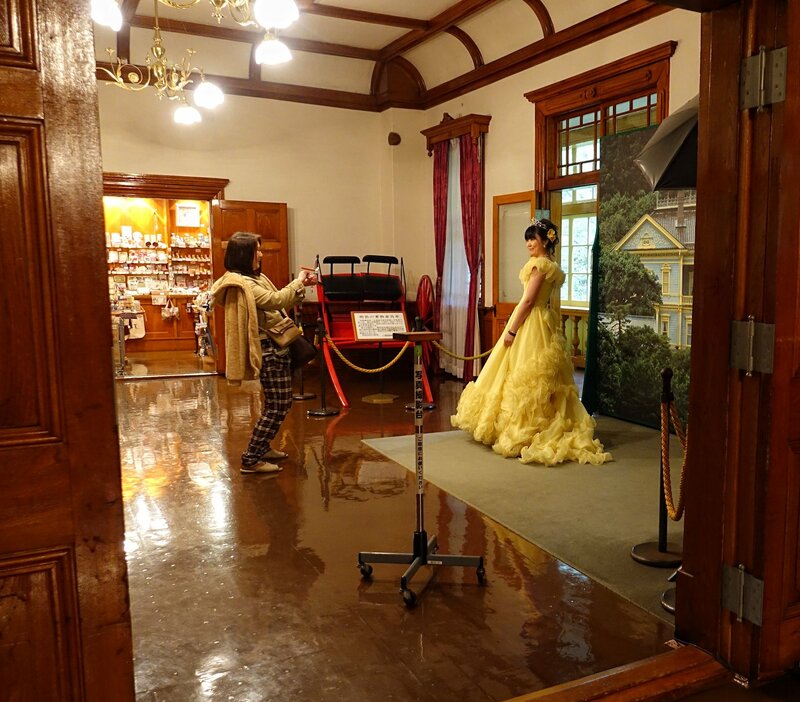 A most popular thing to do when visiting the Public Hall is to rent a “European costume” and become a westerner for a short while. Princess, lord, Charlie Chaplin; you pick. 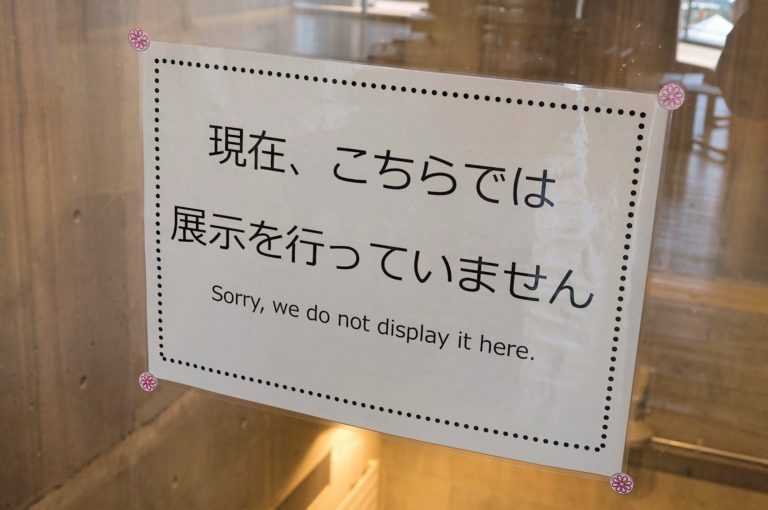 The Japanese seem to enjoy this a lot. Just up the street from the Public Hall, there’s an old Russian Orthodox church. Services still take place here on Saturday evenings and Sunday mornings. There’s no wonder that the Russians were eagerly present here as soon as they could. Even today you can easily “see Russia from your house” from many places on Hokkaido. The Russian Sakhalin island and the Kuril Islands are just a few kilometers away. Our plan was to head up to Mount Hakodate to look down at the city lights, but heavy fog and rains means a change of plans. 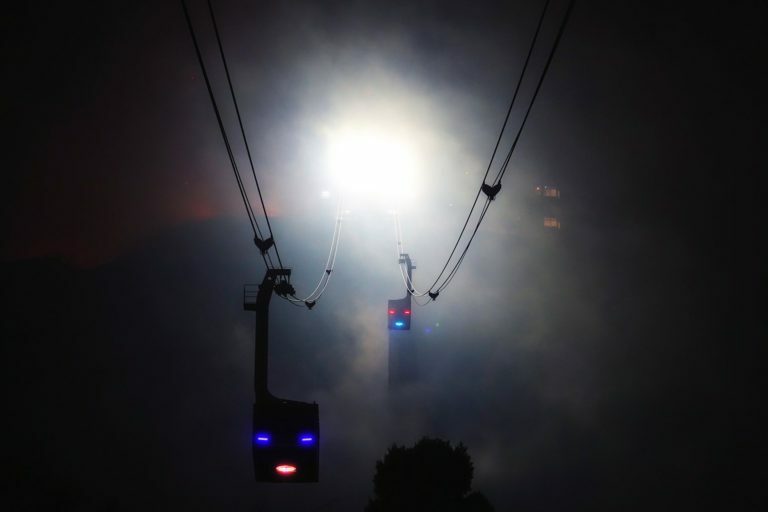 You can sort of see the observation platform high up there in this photo, looking like a red-eyed monster from a sci-fi movie. We go for a walk in Hakodate Park instead. Almost hidden in the dark, the cherry blossom still looks beautiful under artificial lighting on this stormy night. The most popular way to get up to the observation deck above Hakodate is on this ropeway. It looks more than a little bit scary in this fog, like robotic aliens coming down to take you up to the mothership. We still get a nice view of Hakodate from below the fog at the top of Hachimansaka Dori. The large ship down there is a museum and memorial to the Seikan ferries that used to transport trains and passengers between Honshu and Hokkaido, up until the Seikan tunnel opened in 1988. 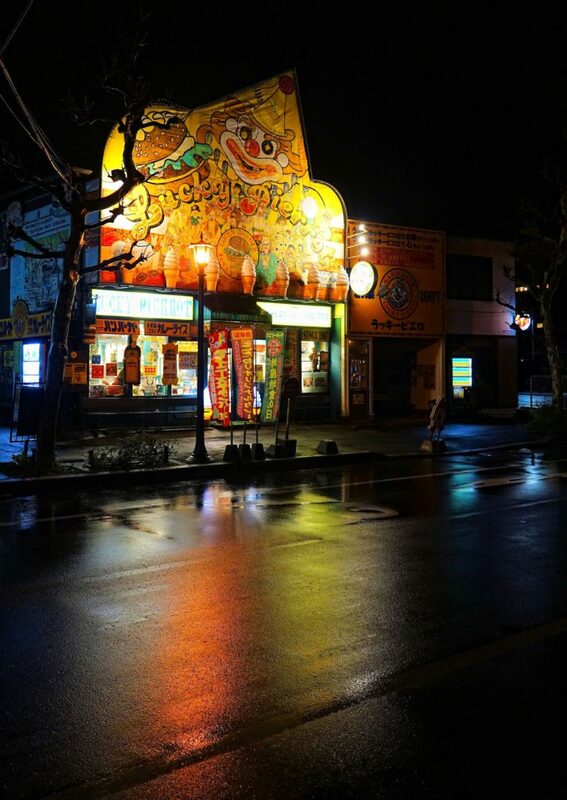 Another sign of the international history of Hakodate is this very local chain of restaurants, Lucky Pierrot. They serve the best burger and fries we get in Japan, and they also do other typical diner courses often with a dash of Japanese food added to the recipe. If you want curry or spaghetti, they certainly have that as well. 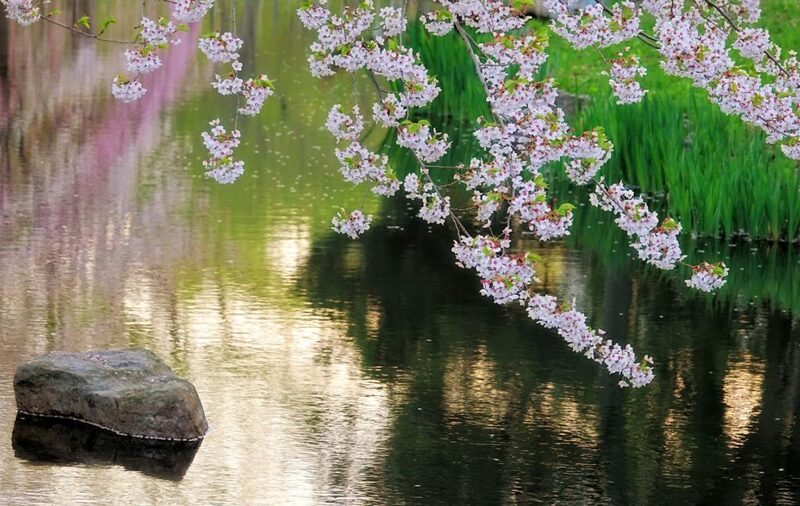 The Japanese cuteness, kawaii, comes into play in many different aspects of everyday life. 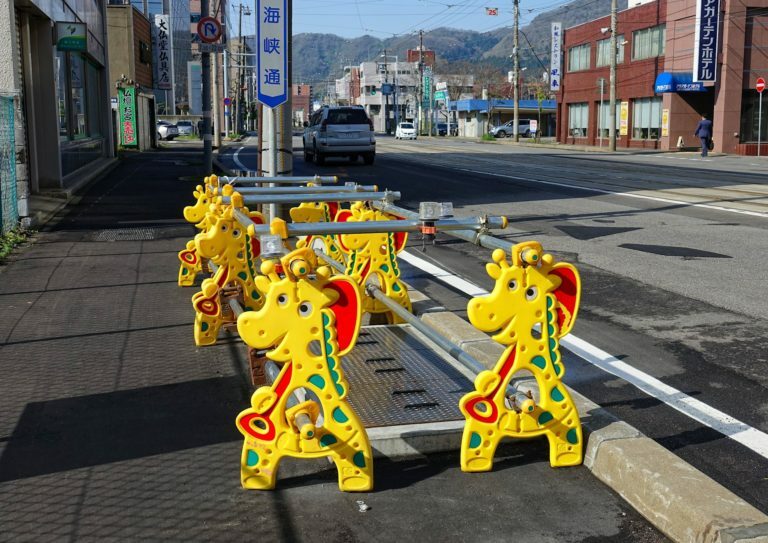 Here’s some construction work fenced off in the most adorable way possible. 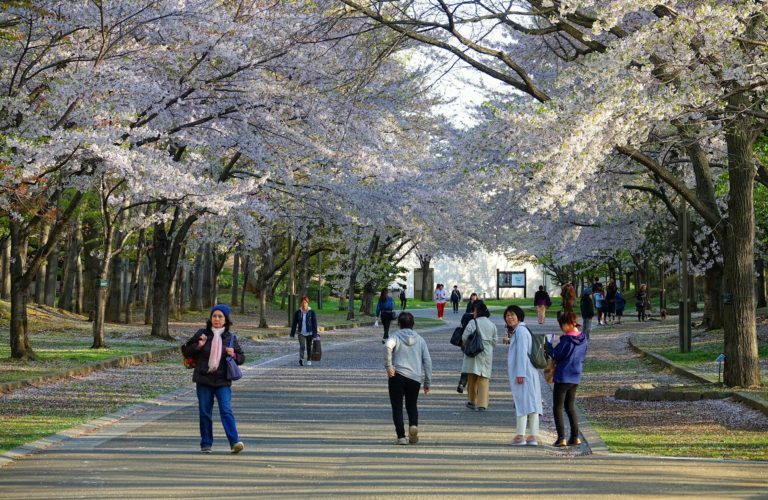 We return to Hakodate Park to have another look at the ongoing cherry blossom, now in daylight. The trees are half-naked after the storm last night, but that’s okay. It looks wonderful still. 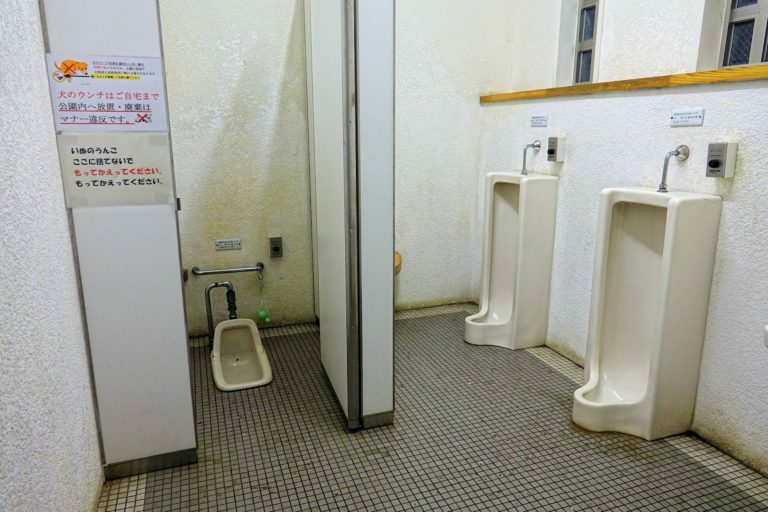 In Tokyo we kept encountering toilets that would play us a symphony, keep our private parts nice and warm, and vigorously turn us perfectly clean after our time on the toilet. 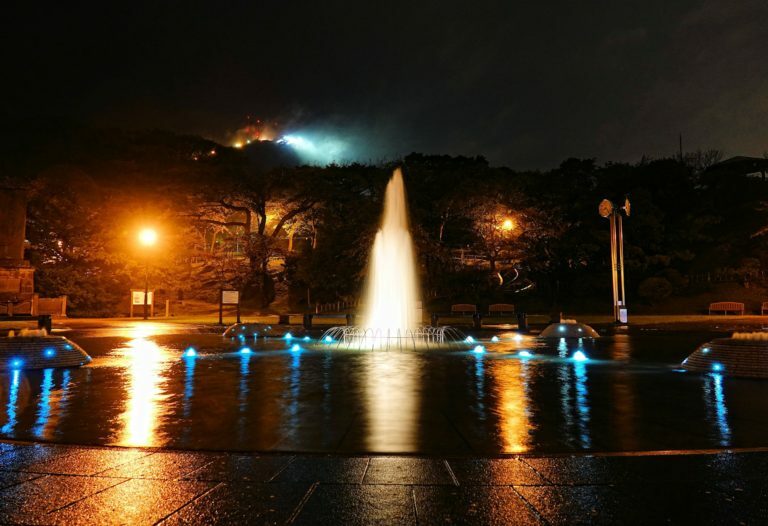 In Hakodate Park, we get this instead. It’s nice to see that not quite everything in Japan has gone completely Space Age yet. There are many interesting attractions in Hakodate, and this is not one of them. 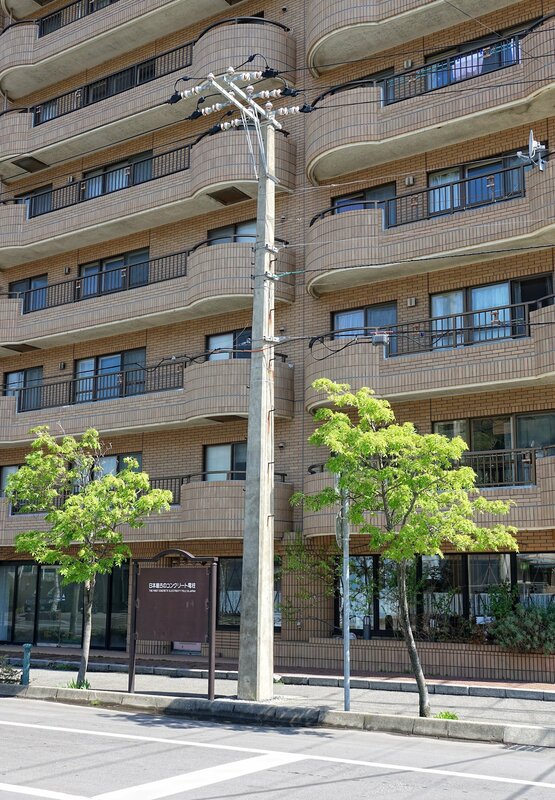 Still, it’s marked on the official tourist map, so we go and thoroughly enjoy the view of the first concrete electricity pole in Japan. Now you don’t have to. 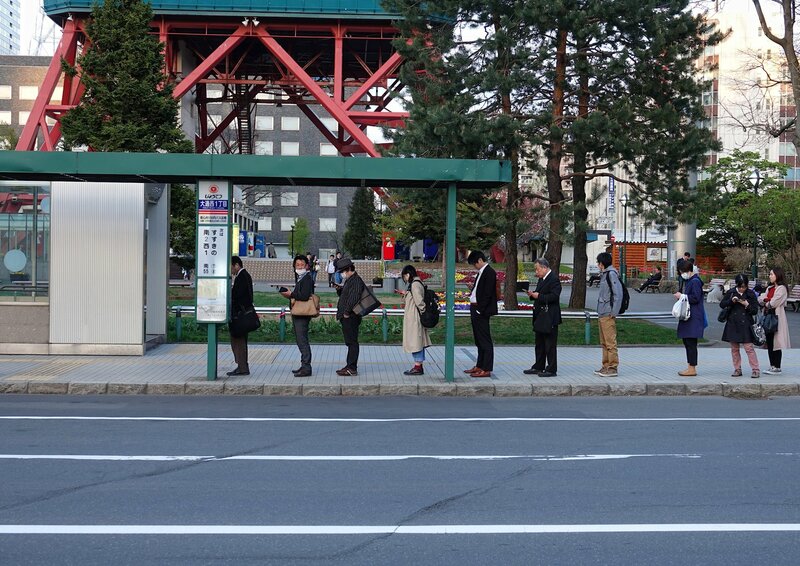 Wherever we go, we see proof that the Japanese are thorough and anything but careless. 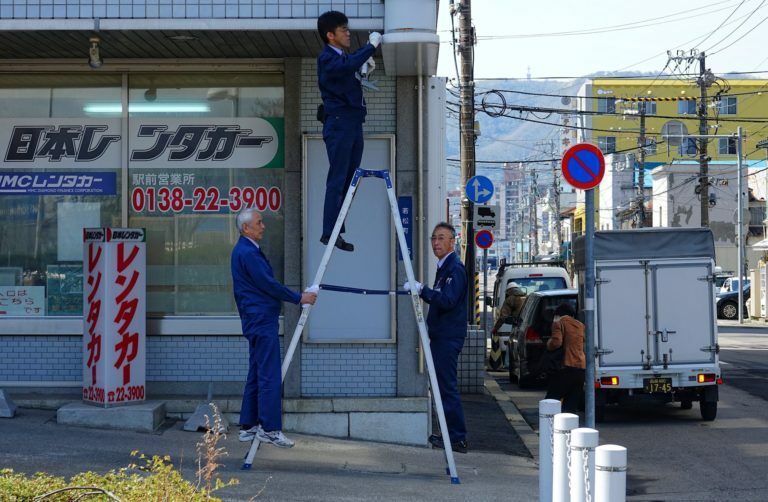 How many Japanese does it take to do whatever that requires the use of a ladder? Probably at least three. Maybe the mentality comes from handling all the potential earthquakes. We get on another train, the Hakodate Main Line. 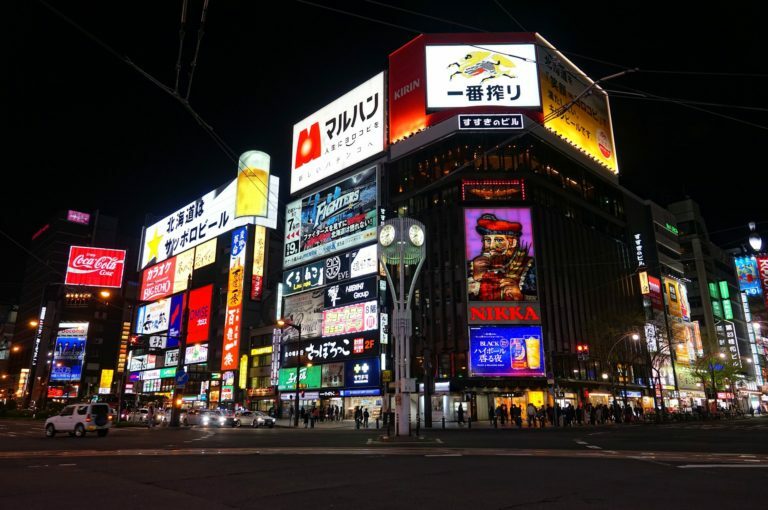 It’s a winding route that takes a long time in transporting us to Sapporo, the largest city on Hokkaido, and the fifth largest in all of Japan. There’s lots of nothing along the way. The slow toy train to Sapporo is comfortable, but again absolutely not the technology wonder we sort of had expected of Japan. The windows are large and clean, so we can enjoy the view of mountains on one side and ocean on the other. A woman goes up and down the length of the train selling food that is better than what you get on trains in most other countries, at reasonable prices. Sapporo seems happier than Tokyo. 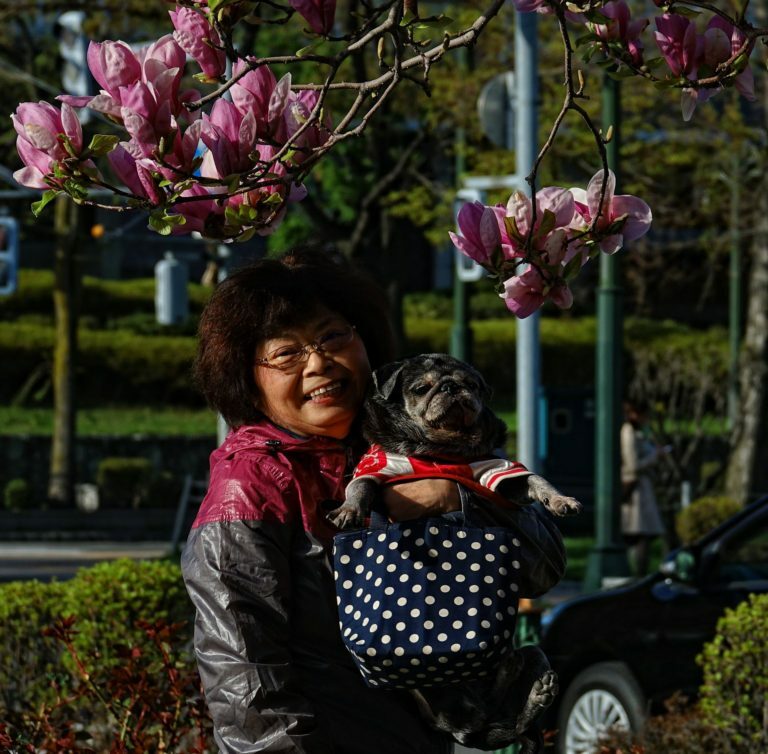 This woman in Odori Park positively beams with pride for her, uhm, charming pet. Having space for a dog in your home is probably easier here. Maybe it’s the people, or maybe it’s the cold weather; either way we are happy to have come here. Even here, as close to the North Pole as you can get in Japan, we often see girls wearing the typical short skirt school uniform that is worn all over Japan. It’s a strange leftover from the uniform modeled after European naval uniforms in the 19th century. They wear it with pride, it seems, but it’s not really well adapted to colder climates. I don’t know who came up with the great idea to build a Ferris wheel on top of a tall building, but I hope they took into consideration heavy winds and earthquake tilts. This is as far north as we get on this trip, and this is partially why we came here. 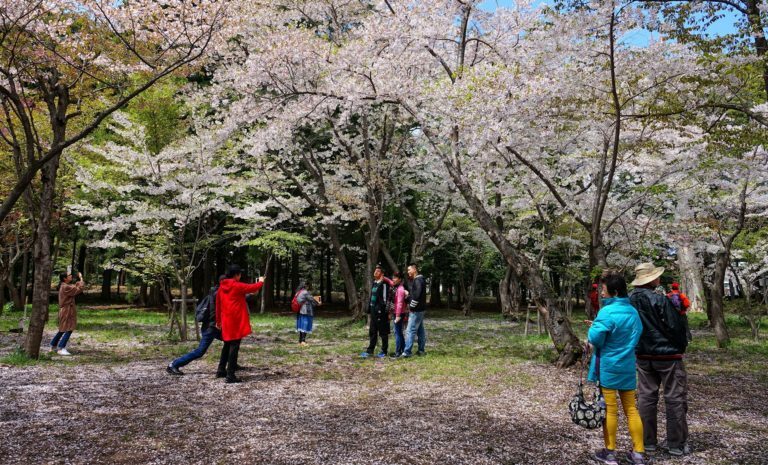 We arrived in Japan too late to see the cherry blossom around Tokyo, but spring on Hokkaido happens at least a month later than around Tokyo. Just like in Hakodate, many petals have come off the trees, but we’re happy with what is left. 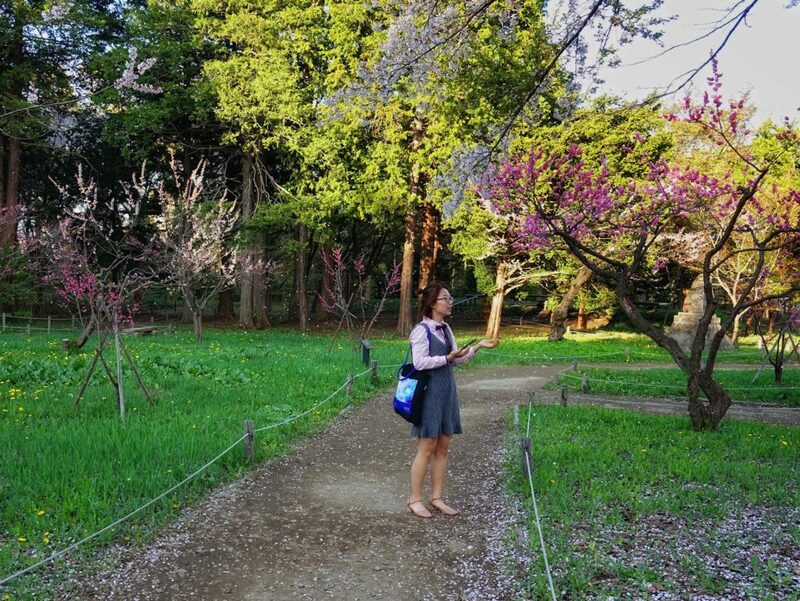 Nakajima Park during the sakura is a funny mix of people. Some just walk by while taking a quick photo, while others are professionals who spend hours to get that perfect portrait. Both segments are probably happy with the results today. 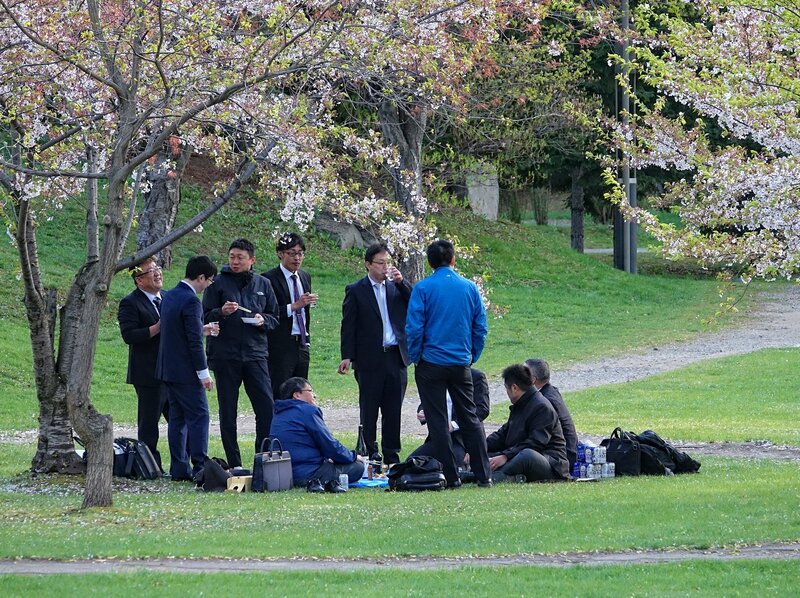 There are all sorts of people at various hanamis, gatherings in the park in celebration of the cherry blossom. 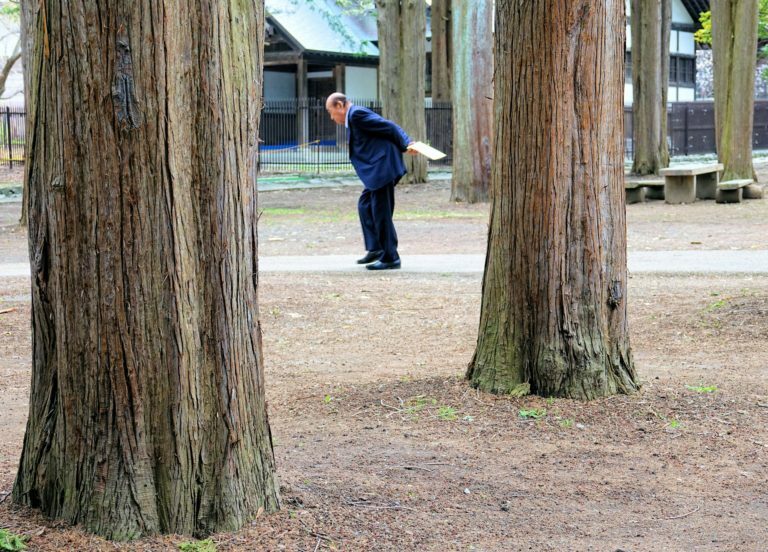 These are coworkers enjoying a cold day in the park with sake and chopsticks in hand. They don’t look entirely comfortable, but drunk. The entire park is just an infinite number of photo opportunities. 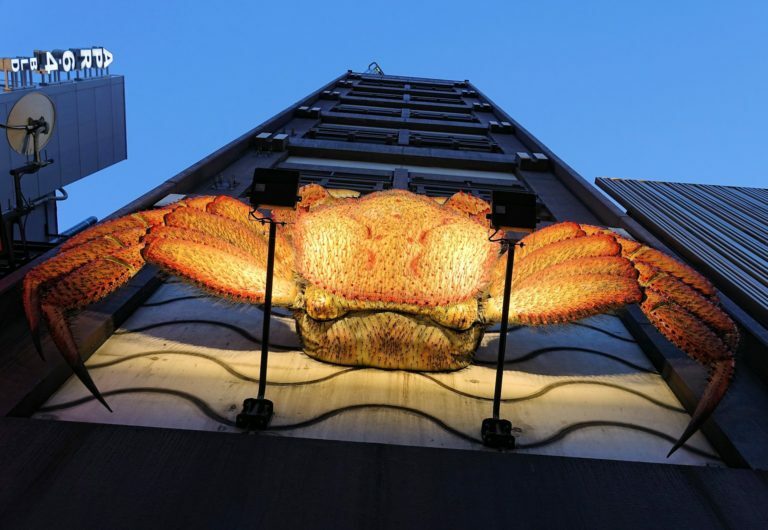 So now almost every restaurant in Sapporo has a giant crab outside. 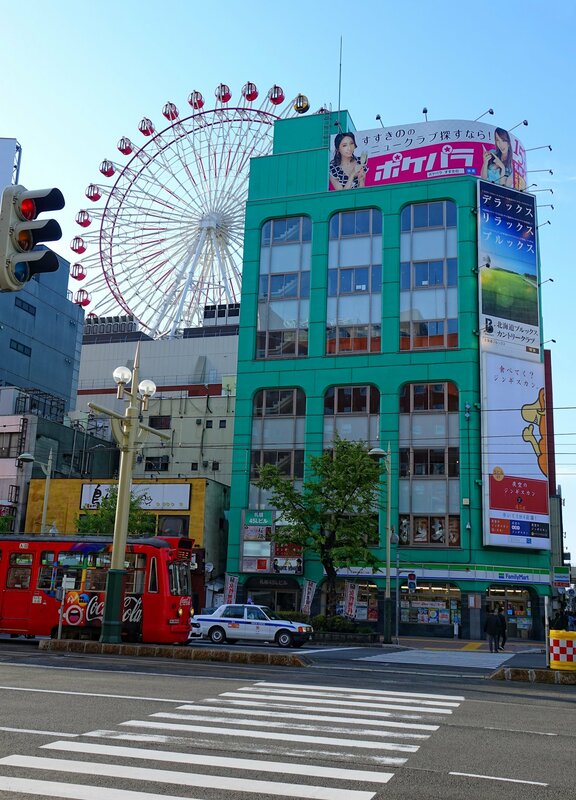 It’s not Tokyo, but Sapporo is definitely a big city. Two million people call it home, and most of them seem to love shopping. 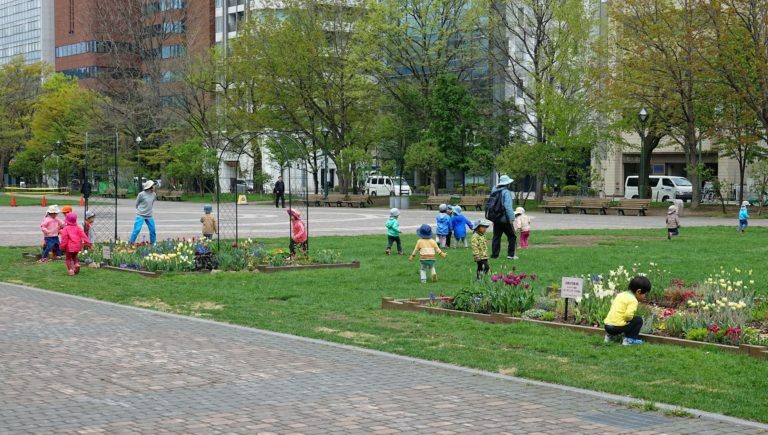 Unlike many school children, those attending kindergarten do not wear a uniform. Sort of. It seems that wearing cute, little hats is pretty universal, though. Kawaii! 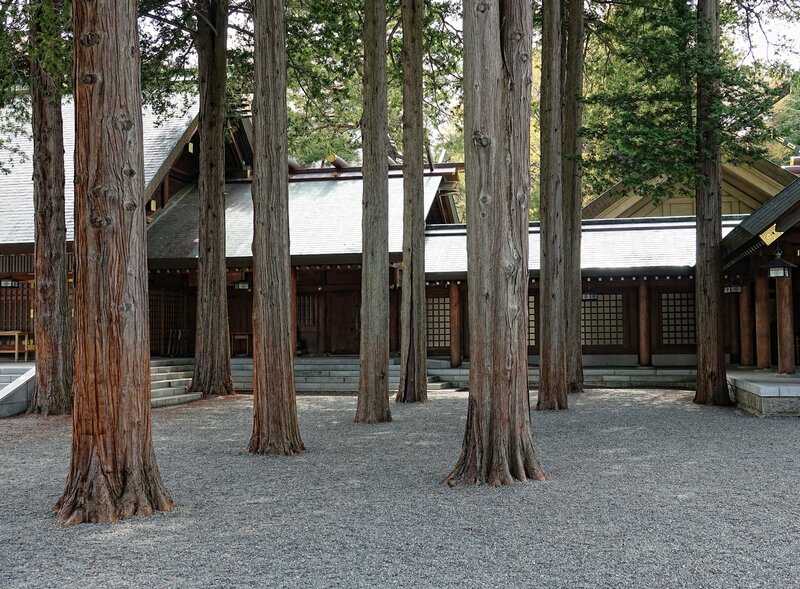 At the western edge of Sapporo we find the Mikado Shrine in Maruyama Park. It’s meticulously manicured, and thankfully they haven’t cut down all the trees to build temples. The nicest trees must have been allowed to live. Hundreds of businessmen, most of them rather old, are having a huge picnic in the park. I don’t know if this was some kind of a surprise party for them, or if they just think that a suit is the best thing to wear for happenings like this. 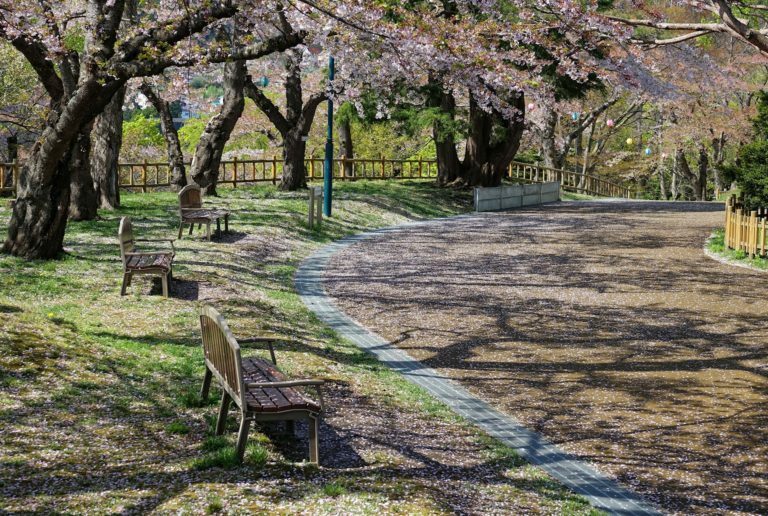 Maruyama Park also has a good number of blossoming trees. It looks like the national selfie day is going on all over the place. I don’t blame them. It’s beautiful. As a divine wind kicks off an intense white and pink shower of petals, this girl is just frozen in place, enjoying the treat, finding her luck hard to believe. Our main reason for coming to Maruyama Park is to visit the excellent Sapporo Zoo. It’s a good day to be here. Few people are around on this weekday just after Golden Week, and the animals are happy to pose for us. It’s a bit unclear exactly what they’re not displaying here, but judging by the high ceiling, I’m guessing a giraffe. Either way, I appreciate the politeness of this zoo and the many amusing signs. 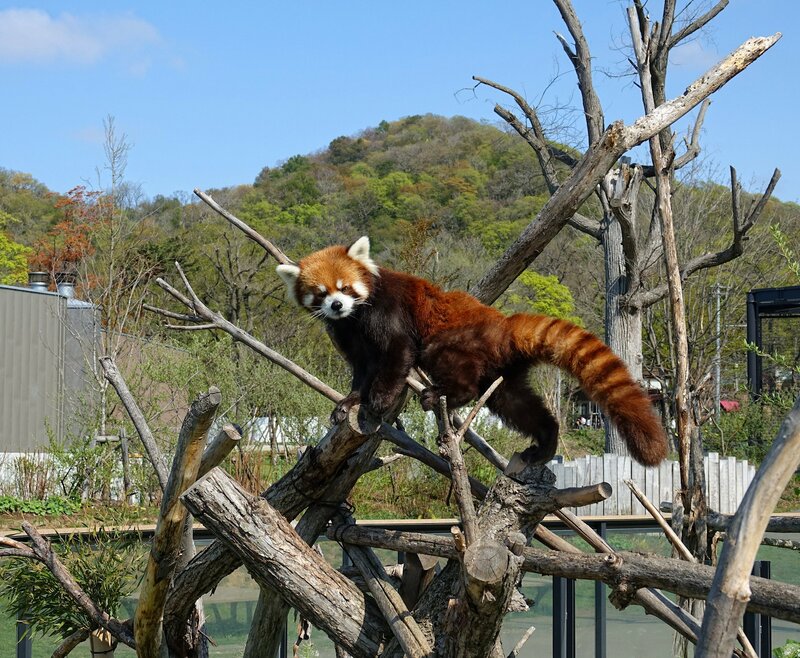 The red panda is usually the cutest animal by far in any zoo. This is true here as well. 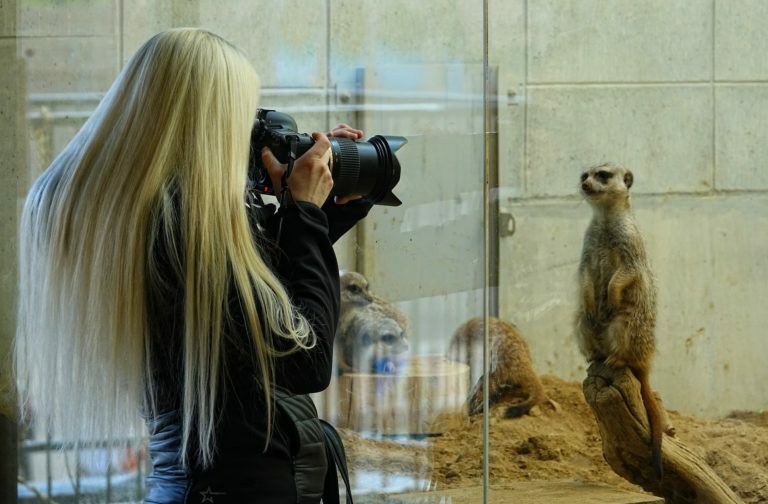 This is the closest we get to see any cruelty against animals in Sapporo Zoo. 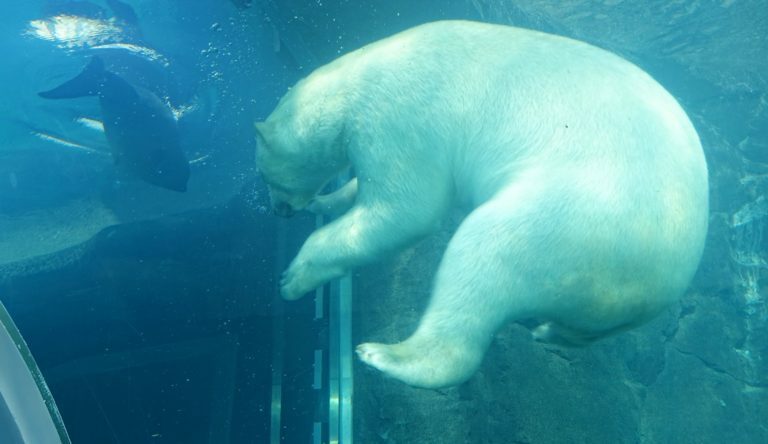 The polar bears share a large pool with a few seals, and the carnivorous interest they show for their neighbours is undeniable. Luckily for the seals, there’s a thick wall of glass separating the species. The polar bear pool at Sapporo Zoo is really, really good. 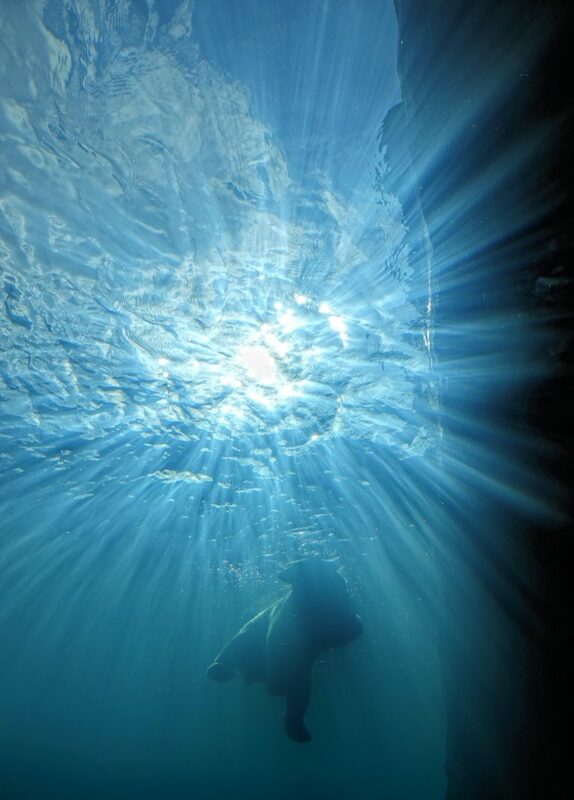 We’re standing in a tunnel beneath the polar bears and watch these giants from the top of the food chain swim around playfully. It’s just magnificent. Satisfied with this small taste of Hokkaido, we get in line for the trip back to Honshu. Our time here has been a pleasant surprise, and if we ever get back to this island, we’ll be sure to make time for seeing the parts outside the cities as well.